Disney’s Art of Animation Resort, the 26th resort at Walt Disney World, will be a one-of-a-kind experience with themed building exteriors and room interiors, and larger-than-life icons from the animated films in the courtyard areas. It will be build across from Disney’s Pop Century Resort at the former location of the ‘Legendary Years’ expansion for Pop Century. All of the themed suites and rooms at Disney’s Art of Animation Resort are expected to open by the end of 2012. 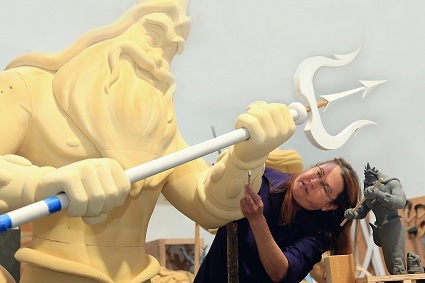 Crowned by a 35-foot-tall model of King Triton, the family-friendly resort will have themed room interiors in its 1,984 new units — 1,120 family suites in The Lion King, Cars and Finding Nemo wings and 864 themed rooms in The Little Mermaid wings. Suites will have both a living room and a bedroom. Construction for ‘Animation’ actually began back in January when work began to prep the property, but official ground breaking will be this summer. As you can see design work is actually quite far along, so they should have no problems having some rooms available in 2012. But those won’t be the only rooms coming to Orlando. This announcement has the Orlando business community ready to invest in new hotels and remodels of their own. The key to the success of this new resort will be the ‘Family Suites’ aspect. Rooms for 6 or more is really the untapped market at Disney right now. Travel trend experts expect that as more and more baby boomers retire families will travel as expanded units. So having room for Mom, Dad, a couple of kids and the grand parents is important. While the announcement of the new hotel has been generally met with positive reactions from Disney fans, one question remains… will they be changing the name of ‘Pop Century’, since it will now remain uncompleted at half a century?